Thank you to everyone who has placed an order so far. The limited edition bottles are already about 50% of the way to selling out, and we have new products already in the works that should be launching soon. We’re working hard to get our sauces out into a few local restaurants and look forward to seeing the smiles on the faces of our customers as they enjoy our terrific sauces. If you’ve already bought some of our sauces we’d love to see a picture of you with our sauce, or just a picture of our sauces enjoying their rightful place of honor in you home. 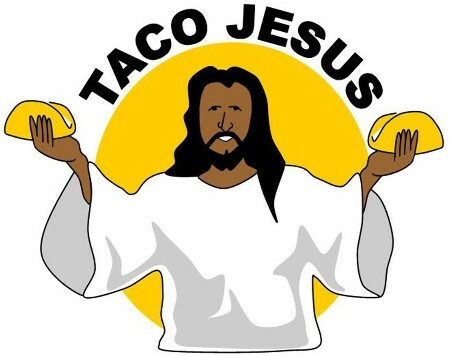 You can email a photo to photos@thetacojesus.com or tweet to @tacojesus using the hashtag #WWTJD. Thanks again to everyone who has already placed an order. To those of you that haven’t, what’s the deal … ? This entry was posted in Message from Taco Jesus and tagged grand opening, hot sauce, limited edition, taco jesus, tacos by Taco Jesus. Bookmark the permalink.